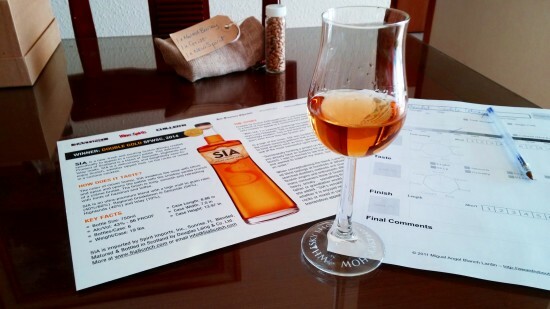 A few weeks ago I received an email offering me to taste a new whisky from USA called SIA. Umm, free whisky… umm too good to be true. Let me introduce you SIA and then I explain you a few things that really raised my expectations. SIA was funded through Kickstarter by Carin Luna-Ostaseski using malts from Speyside, Highlands and Islay… well… so SIA is a Scotch whisky and bottled in Scotland by… guess who… Douglas Laing & Co!. Yay! The makers of Peat Monster and Scallywag. Yay! Enough smalltalk… let’s taste this whisky! Nose (88): more than average. honey, spices, citrus, cinnamon, peaches, vanilla, smoke, tobacco, corn. Palate (87): light, powerful. honey, vanilla, spices, citrus, wood, smoke, peaches. Finish (88): longer than average. honey, smoke, spices. So based on other whiskies I have already tasted I rate this SIA Blended Scotch Whisky with 88 points over 100. And definitively… this is to good to by mixed! Enjoy it straight! Grow up!